Questcor Pharmaceuticals Inc. (Nasdaq: QCOR) shares surged some 30% in premarket trading Monday after announcing it has agreed to be acquired by Mallinckrodt PLC (NYSE: MNK) in a $5.6 billion cash and stock deal. Shortly after the opening bell, shares of Anaheim-based Questcor climbed 25%, or $17, to $85.07, a 52-week high. Shares of Dublin-headquartered Mallinckrodt, which had been up 7.5% in early trading, slipped 2.29%, or $1.54, to $61.30 on extremely heavy volume. Less than 30 minutes into the session, 5.6 million MNK shares changed hands, five times the stock's average daily volume. Mallinckrodt, which just completed a $1.3 billion acquisition of Cadence Pharmaceuticals last month, said the combined company will reap increased scale, revenue, profitability, and cash flow. The deal nicely plumps up Mallinckrodt's pipeline, which it has been building with specialty drugs focused on the profitable complex and chronic disease segment. The Irish pharmaceutical giant expects the deal to be "immediately accretive" to FY2014 adjusted earnings and "significantly accretive" to FY2015 adjusted earnings. "With Questcor, combined with our recently completed acquisition of Cadence Pharmaceuticals, the new Mallinckrodt will have a significant, established presence with prescribers, payers and hospitals," Mallinckrodt Chief Executive Officer Mark Trudeau said in a statement. "We will also have an increasingly diversified specialty pharmaceuticals portfolio, which will include novel therapeutics for pain management, as well as central nervous system, renal, rheumatologic and other autoimmune and inflammatory disorders." Under terms of the deal, Questcor shareholders will receive $87.10 per share, which includes $30 cash and 0.897 Mallinckrodt shares for each Questcor share owned. 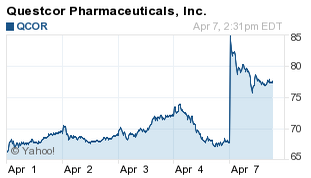 Based on QCOR's April 4 closing price, the deal represents a healthy $27 per share premium.